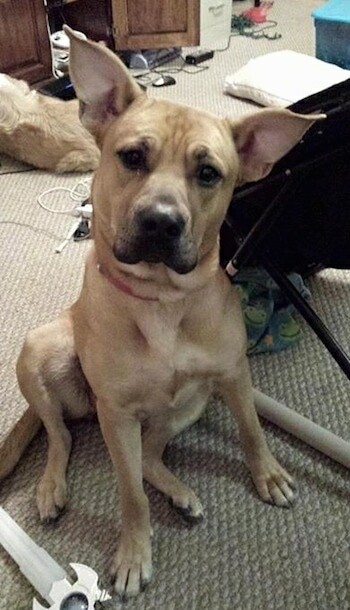 Tyler the German Shepherd / Pit Bull mix at 11 months old—"Tyler is the most loving dog I've ever met. He loves to be held and to give kisses. He doesn't like when his friends are hurt, he will lick their wounds, he wants to make them feel better. 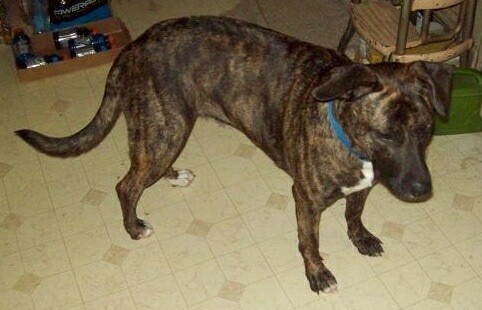 When people hear what mix he is, they are very quick to judge... who in their right mind would mix 2 breeds with such a bad reputation? I for one am happy that they did! 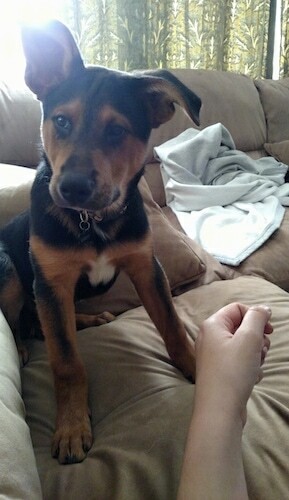 He's the sweetest dog ever!" The Shepherd Pit is not a purebred dog. 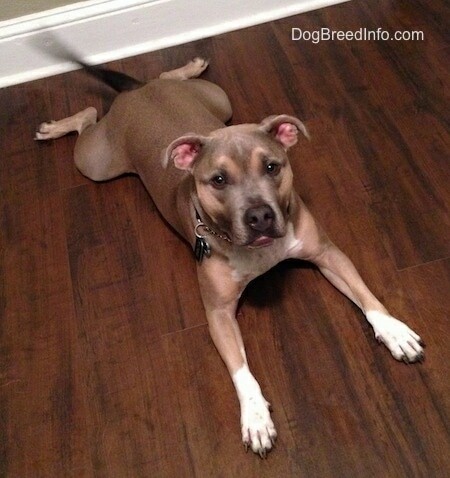 It is a cross between the German Shepherd Dog and the American Pit Bull Terrier. The best way to determine the temperament of a mixed breed is to look up all breeds in the cross and know you can get any combination of any of the characteristics found in either breed. Not all of these designer hybrid dogs being bred are 50% purebred to 50% purebred. It is very common for breeders to breed multi-generation crosses. 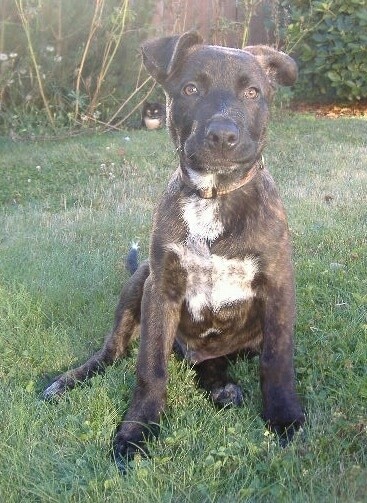 Rusty the haf German Shepherd / half Pitbull Terrier mix as a puppy at 5 months old—"Rusty is a sweet and loving dog. He loves people and though he's teething and tries to nibble on my hand when I pet him, he doesn't ever try to nibble on strangers or neighbors. 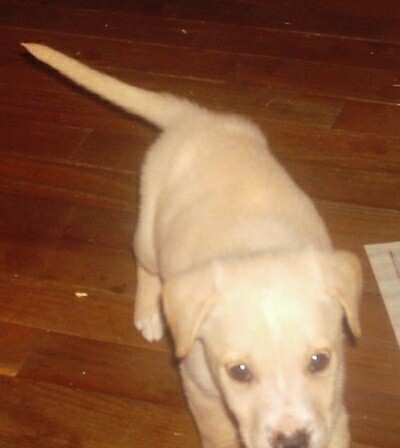 He has a ton of energy and is very stubborn but he is also very smart. He was potty trained in one week without barely any effort. Rusty craves attention and is kind of difficult to train because of his stubborn personality and he doesn't like to cuddle (unfortunately). He loves to play with our 12 year old Lab Retriever mix and he doesn't hurt her at all even though she gets annoyed with him easily. " 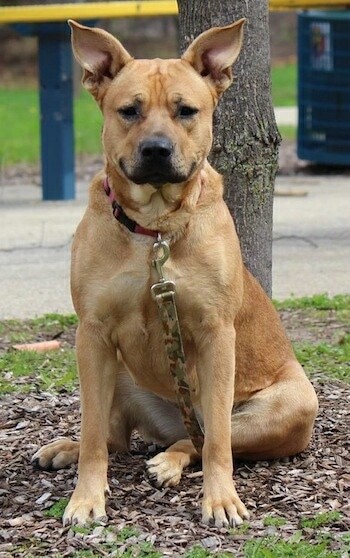 Paisley the Shepherd Pit (German Shepherd Dog / American Pit Bull Terrier mix) at 1 year old—"Paisley is a happy go lucky dog who loves everyone she meets. She loves to run and play but she knows when its time to calm down. I think this is the best breed combo." 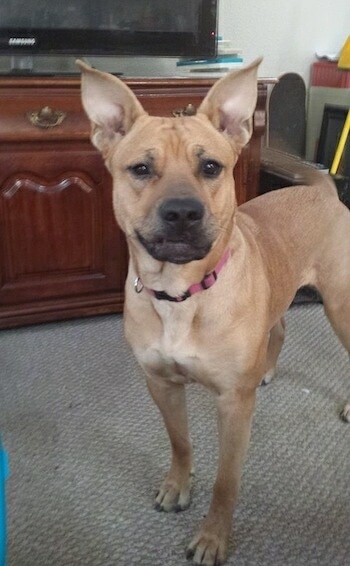 Lydia the Shepherd Pit (German Shepherd / American Pit Bull Terrier mix) at 1 1/2 years old—"Lydia was 7 weeks old when we got her. She has become the best dog I have owned. She is smart and protective of her family and home." 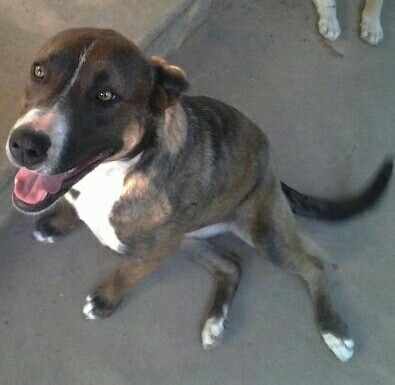 Murray the German Shepherd / Pit Bull mix at 5 years old—"The first six months of his life are uncertain, but he spent the next six months in a shelter. He was being shown at Petsmart for adoption and they were giving up hope in finding him a home. I went in for cat food and the second I saw him, I knew! 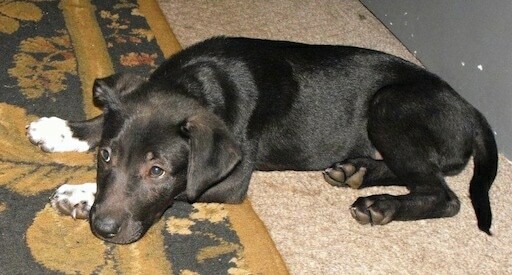 He was skinny and stinky, but I looked at my husband and said we're getting this dog! Murray is handsome and happy. He goes camping with us, loves to ride in the car and going to the vet. He's chased many deer, gotten skunked in the face four times and fought raccoons. I've only recently started watching the Dog Whisperer, Cesar Milan and it re-enforces that I've been doing almost everything right in my handling and understanding of my dog. I've learned from Cesar, to claim your space with other dogs, as well as my own, how to stay calm and meet a new dog and how not to let the dog exit or enter a house before you. I knew I wasn't going to be one of those women being dragged down the street by a dog half my weight so from the start, he was trained to walk with me and not pull me. 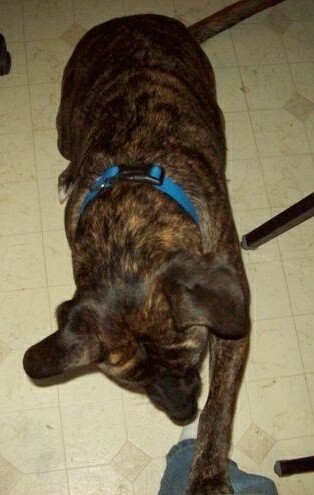 I've used mouth click sounds or a quick tug on his leash and he's quick to follow. He has three long walks everyday, and watching him find his groove and 'prance' is pure joy for him and me. Through being kind and patient, I've shown him that the back scratcher isn't a weapon and the hair dryer isn't as terrifying as he thought. Now he comes to the room for the enjoyment of getting 'blow dried' (on the cool setting)and affection. Because of Cesar's understanding of dogs, countless people are becoming in tune to the language of a dog. I've noticed only half of the dog walkers around here know how to walk their dog and for the ones that do, their dog's good and polite demeanor is evident in their dog handling. Unlike the tiny terror and his tiny owner- who thinks his insane high pitched barking is friendly. One day, walking out of the woods, the sunset was beautiful and I said "sweet" out loud and Murray stopped, looked back and thought I'd said "treat"! We laughed all the way home! 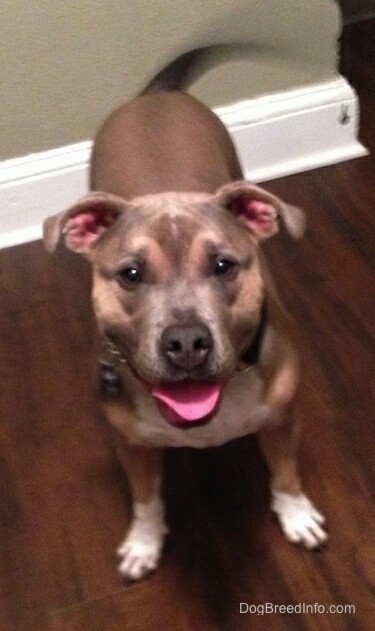 I love my Shepherd Pit mix and I am his proud pack leader!" 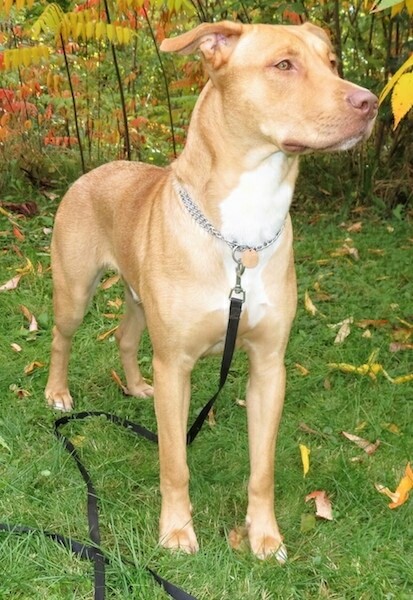 Deci (December) the Shepherd Pit at 1 year old—"She's a gorgeous dog with a really high-energy drive. She's protective when in the presence of strangers, unless we tell her not to be. Then she's completely submissive and tranquil. To combat this energy of hers, we run two miles twice a week, and walk one on the days that we don't run. She's never been aggressive. We can bring dogs into our home and she immediately accepts them into our pack. :) Overall, an amazing hybrid that I will surely come to own again! We might decide to adopt one as a second companion for Deci. 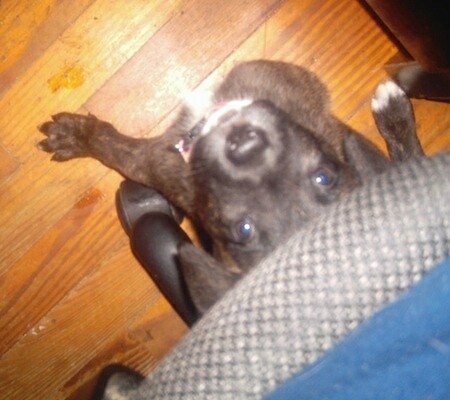 I really should since we recently lost our American Pit Bull pup." 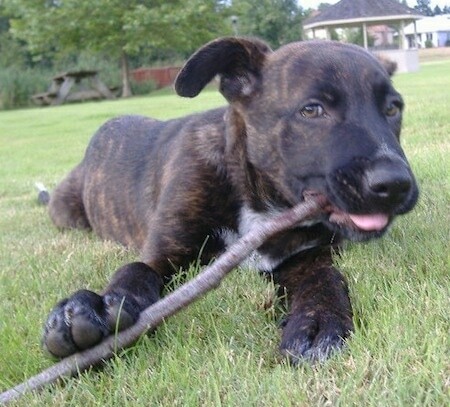 Peetie the 50% German Shepherd and 50% American Pit Bull Terrier puppy at 3 months old—"He has the personality and traits of a Shepherd." 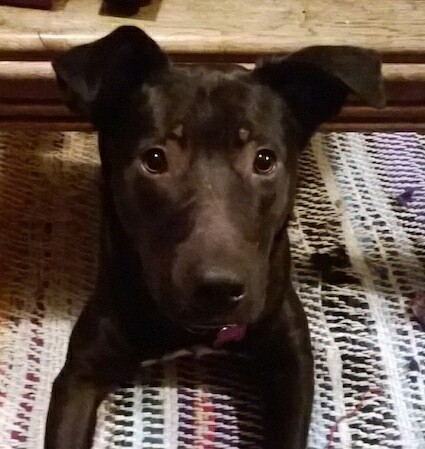 Raven the Shepherd Pit puppy—"She is a German Shepherd / Pit Bull mix. 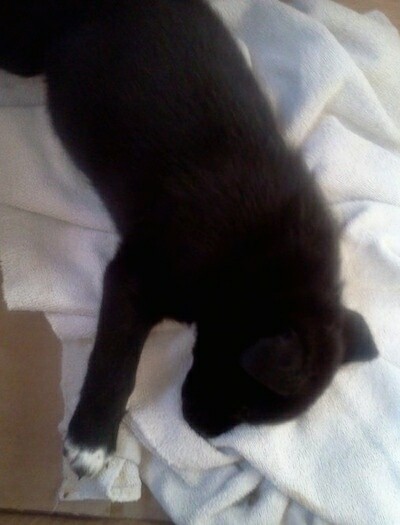 She is very rambunctious but calms down in time for her nap. She was the only one out of the litter to be black and white. The other puppies were brown and white. 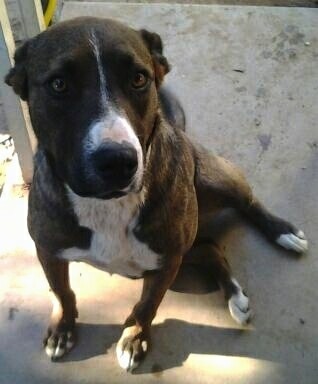 Her mother was a German Shepherd and her father was a Pit Bull." Zoe the Shepherd Pit at 5 years old—"Zoe and Precious (below) are sisters, from the same litter. 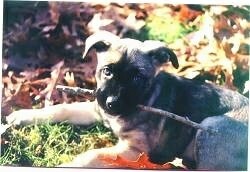 The Mother was a Pit Bull and the father a German Shepherd. They crave attention, are very loving, exceptionally intelligent, loyal and protective. I got them as pups."